Britain’s exit from the European Union was thrown into turmoil on Tuesday when the withdrawal agreement negotiated by the bloc and Theresa May’s government was soundly rejected by the House of Commons. In a major embarrassment for May, MPs voted 432 to 202 to reject the deal, just over two months before Brexit is due to take place. Those who voted against the deal included 118 MPs from May's own Conservative Party. Mrs May will now face a confidence vote on Wednesday, after the Opposition Labour Party tabled a no-confidence motion as soon as the scale of the government's defeat was announced. Should she win that vote, Mrs May is expected to hold talks across the House to seek consensus. "We must focus on ideas which are genuinely achievable," she said, adding that she would then discuss them with the EU. European Commission chief Jean-Claude Juncker urged London to "clarify its intentions as soon as possible", warning: "Time is almost up". EU negotiator Michel Barnier said he "regretted profoundly the vote" but that it was "too early to assess all the consequences". Her own backbenchers rebelled in huge numbers, but the ringleaders said they would vote for her in the confidence vote scheduled for around 1900 GMT, which she is expected to win. However, Britain's newspapers were withering in noting the scale of her defeat, a damning verdict on 18 months of negotiations with the EU. The top-selling Sun tabloid said May was "crushed", while the Daily Mail said her power was left "hanging by a thread". One commentator in The Times described her as a "zombie prime minister". But the vote raises even deeper questions on the future of the Brexit process itself. The Labour Party is calling for a general election and a new government to re-negotiate the Brexit deal, but the European Union says it is not keen to reopen talks in any substantive manner. Other alternatives include a second referendum – which May is vehemently opposed to – an extension of the Brexit date for possible fresh negotiations, a ‘no deal’ Brexit which will see the UK and the EU parting ways without any agreement, or ending the Brexit process altogether. “You are not children in the playground, you are legislators,” Attorney General Geoffrey Cox, representing the government, told MPs shortly before the vote. Cox warned that the current deal would have to return "in much the same form with much the same content" for another vote if this one failed. Opposition to the agreement had already forced May to postpone the vote in December in the hope of winning concessions from Brussels. Most British MPs argue that the deal negotiated by May could lock Britain in an unfavourable trading relationship with the EU and prevent it from striking trade deals with other countries. MPs of the Democratic Unionist Party, which props up May's Conservative Party, say the deal treats Northern Ireland separately from mainland UK. 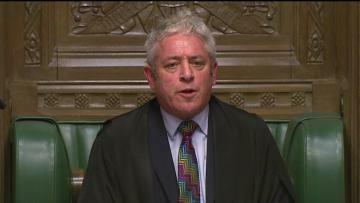 Theresa May speaking in the Commons on Tuesday. 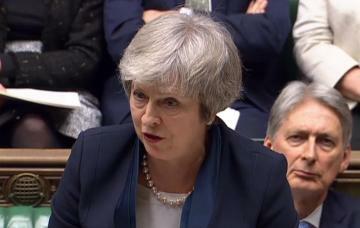 Mrs May said in a statement before the vote that the deal she had negotiated safeguarded the rights of citizens of the UK in Europe, it safeguarded trade and security arrangements and delivered the foundations for an ambitious trading relationship which included forging trade deals with other countries. She insisted that holding a second referendum would cause further divisions, and a general election would also create division and uncertainty without a guarantee of any new deal with the EU. Mrs May said she 'passionately' believed that the outcome of the 2016 Brexit referendum had to be delivered and she would react quickly to the outcome of Tuesday's vote. Read: Would a Norway option break the Brexit stalemate? In terms of a decision taken by the House of Commons last week, Mrs May is now due to present her ‘Plan B’ to parliament on Monday. 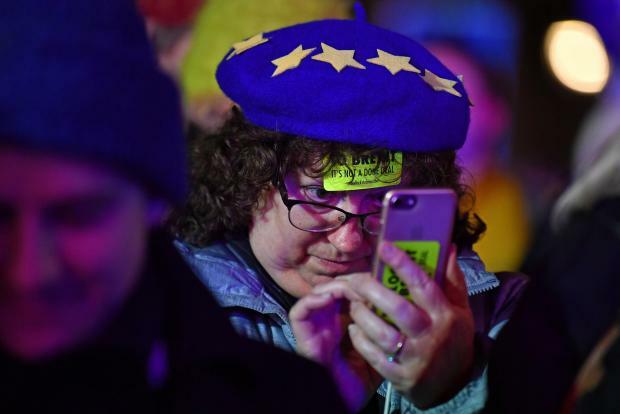 Brexiteers and Remainers held rival protests outside the House of Commons as MPs concluded their debate and voted. 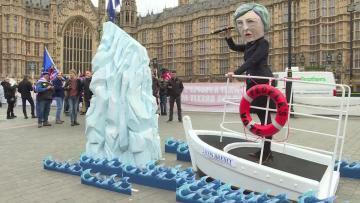 They paraded flags and placards and there was even a float which depicted Theresa May riding on the ill-fated Titanic. From the shock Brexit referendum result to Tuesday's momentous vote on Theresa May's unpopular divorce deal with the European Union, here are the milestones on Britain's rocky road out of the bloc after 46 years. In a race to replace Cameron, key Brexit campaigner Boris Johnson does not put himself forward as expected and May, the interior minister who had backed remaining in the bloc, becomes prime minister on July 13. On March 13, Britain's parliament gives final approval to a bill empowering May to trigger Article 50 of the EU treaty which lays out the process for leaving the union. To capitalise on the perceived weakness of the opposition Labour party and strengthen her hand in Brexit negotiations, May calls a snap election for June 8, 2017. Her gamble backfires as the Conservatives lose their parliamentary majority. They are forced to strike a deal with Northern Ireland's Democratic Unionist Party (DUP) to govern. The European Union on November 13 publishes contingency plans for a "no-deal" Brexit. But the embattled leader survives the challenge, securing the backing of 200 Tory colleagues, while 117 voted against her. The result meant May is immune from further internal party challenges for a year. The House of Commons, Britain's lower house, finally gets its chance Tuesday to vote on the draft withdrawal agreement that May struck with EU leaders in December. With opposition parties and dozens of Conservative MPs all rejecting it for their own reason, the government is defeated and Britain enters even more uncharted territory with the fate of Brexit itself up in the air.